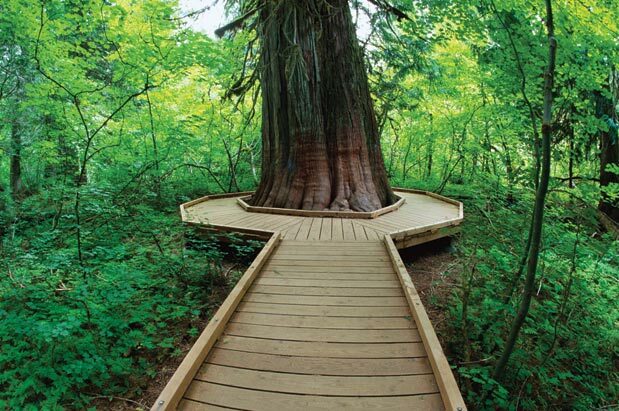 If you like your trees old—really old—this easy one-and-a-half-mile lollipop loop is a must. The grove is home to some of the oldest (more than 1,000 years) and biggest trees in western Washington; strolling amongst their cathedral beauty truly inspires awe. The trail winds through a stand of old red cedars before reaching a new suspension bridge, rebuilt after the violent 2006 storms left the old one a twisted wreck. Sway and bounce single file across the Ohanapecosh River to land on the island that houses the Grove of the Patriarchs, where enormous trees, protected from fire by the surrounding river, have grown to more than 25 feet in circumference (at least one is nearly 50 feet around) and 300 feet tall. Walk in hushed reverence along the boardwalk loop that weaves in between giant nurse logs, hemlocks, cedars and Douglas firs. Sit and stare for a while on one of the lovely, well-located wooden benches. Slap on another layer of bug spray; this is a boggy area, and you’ll share your adventure with vigorous mosquitoes, and, usually, dozens of happy tourists and tree lovers. Probably the easiest hike on Mount Rainier, this trail, while not paved, is wide and well used; a wonderful hike for children and grandparents. While old-growth trees (more than 250 years old) can be found in a few parks around Seattle, only Seward Park boasts a 120-acre forest full of them. This so-called Magnificent Forest, which takes up the northern two-thirds of Seward Park, makes for a nice in-city hiking destination. Tuck into the woods from any of the 13 unmarked “trailheads” off the park’s perimeter drive (popular with walkers), and leave the bustling and noisy world of barbecuers and inline skaters behind. If you love to hike in the Cascades or Olympics, you’ll feel right at home here, whether for a brisk walk on your lunch break or for a full-on five-mile hike to make your primary-care physician proud. Besides getting your heart pumping, hiking through the old-growth forest, and perhaps imagining how the rest of our urban world once looked, may also stir your soul.